45% of the dollars spent on workers compensation claims are doled out for falls from higher elevations. The high dollar figures incurred by these on-the-job accidents reflect the serious nature of the injuries that workers suffer during a fall. The impact of falls on your contractors insurance and your business is extremely costly if your a roofing contractor. As a roofing contractor, you and your workers will be involved in a variety of projects. These projects could include tear off and replacement of an old roof or construction of a new roof. You could also be installing a metal, ballast, low-pitched or high-pitched roofing system. Whatever you and your crew are working on, you will be doing work at a higher elevation. The major risk and liability that you face will come from falls. The risk is to you and your workers’ well being. The liability will present itself in the form of higher premiums on your roofing insurance in your workers compensation claims. You want to avoid those greater risks and costs. Here are some ways to do it. Your plan should include what equipment will be needed to complete the job safely. The cost of the equipment should be part of the bid. The workers should be trained on how to use the safety equipment. The plan should also have strategies to safeguard against potential hazards at the job site. Have all fall protection equipment regularly inspected to ensure it has no defects. The harness should fit the worker properly to provide maximum protection. The worker should always stay connected to the lifeline. The lifeline offers a significant defense against a fall. Holes, openings and skylights present definite fall hazards. However, these type of falls can be prevented. Guardrails can be used to surround skylights and openings. Covers can be secured across a hole to danger proof it. You should choose the right height ladder, so the worker does not have to reach out to any great distance from the ladder. The worker should always face the ladder, and it should be secure to the ground. 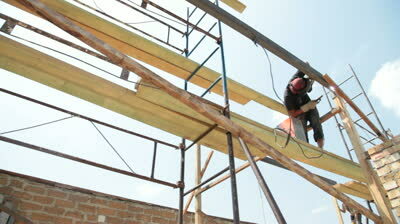 While on the ladder, the worker should maintain three points of contact. The worker should never be on the top step of the ladder. Scaffolds like all types of safety equipment need to be inspected before being used. Scaffolds need to be fully planked. These planks ought to be plumbed and leveled to ensure stable footing. Scaffolds should offer easy access because workers can be loading materials on to them. Guardrails must surround the scaffold to provide maximum protection from falls. Never use ladders on a scaffold. Taking precautions to prevent falls is a significant part of risk management for your business. Lowering your workers compensation claims has a positive impact on your roofing insurance experience modification rate (EMR). Every business starts with a 1.0 EMR rate (low claim activity). However, if you file a number of claims, your EMR rating on your contractors insurance can go up. Some owners won’t allow you to bid if you have above a 1.0 EMR rating on your roofing insurance. That’s why it’s important for you to put in place as many safety measures as possible to prevent falls, since they are the most expensive injuries.